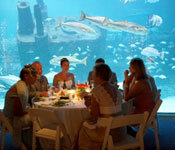 Host your event at the North Carolina Aquarium at Pine Knoll Shores, and trust your guests will be talking about it for a long time. Whether it’s business-based, a social gathering or a wedding, your guests and you will enjoy the venture through our North Carolina aquatic environments, and you will have memories of a lifetime. The Aquarium is available for rental during business hours for private meetings of 130 or fewer and for evening functions for 1,000 or fewer. Please use this website to view photos and learn more about what our facility has to offer. 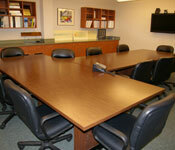 The Conference Room is ideal for a daytime meeting or a small round-table discussion. It features a large conference table, comfortable chairs, television, AV system, laptop connections (wireless internet available) and local phone service. Seating is limited to 14. The conference room is not available for evening rentals. Please have two greeters; one stationed at the main entrance, the other at the entrance to the Conference Room. • Note that rental time covers set-up, meeting and clean-up time. The Big Rock Theater, adjacent to the entrance lobby, is the Aquarium’s auditorium and primary performance venue. It has a seating capacity of 150. Equipped with a large-screen AV system, it is ideal for small-scale performances, formal presentations, meetings and lectures. 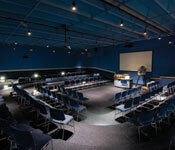 Rental of the Big Rock Theater includes access to the Aquarium’s main entrance lobby and restrooms only. Other galleries and exhibits are closed to this venue. Refreshments can be served in the lobby entrance area. The Big Rock Theater is seasonally available for daytime rentals. Please inquire with the Special Events Coordinator for more details. 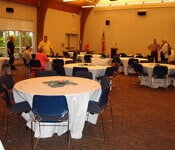 • Note that rental time covers set-up, event and clean-up time. 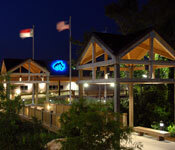 Soundside Hall is the Aquarium’s multi-purpose area – lecture hall, banquet/luncheon room, retreat facility and small-party site – recommended for 125 or fewer guests. Located off the Piedmont Gallery and overlooking beautiful Bogue Sound, this spacious room measures approximately 37’ x 50’ and features a high cathedral ceiling, a working fireplace, an adjoining wooden deck, AV systems and a full-featured catering kitchen. Please have two greeters; one stationed at the main entrance, the other at the entrance to Soundside Hall. Rental of Freshwater Galleries plus Soundside Hall includes access to the Aquarium’s main entrance lobby, Mountain and Piedmont Galleries, Soundside Hall, Soundside Hall deck and the catering kitchen. Other galleries and exhibits are closed to this venue. Soundside Hall is a perfect ceremony site, lecture hall, banquet room and retreat facility, recommended for 125 or fewer guests. Located just off the Piedmont Gallery and overlooking beautiful Bogue Sound, this spacious room measures approximately 37’ x 50’ and features a high cathedral ceiling, a working fireplace, an adjoining wooden deck and AV systems. Rental also includes assistance from the Special Events Coordinator, Housekeeping and Aquarium Security. Recommended for parties of 125 or fewer. • Minimum five-hour rental – 5:30 p.m. to 10:30 p.m.
• Note that rental time includes set-up, event and clean-up time. • The Aquarium is a public venue until 5:30 p.m. Event set-up in public galleries can begin at 5:30 p.m.
Additional Hours: $350 per hour charge over standard five-hour time frame. Rental of the Saltwater Galleries includes access to the Aquarium’s main entrance lobby, Big Rock Theater (as needed), the Salt Marsh Boardwalk and three exhibit galleries -- the Coastal Plain, Tidal Waters and Ocean Galleries. The Ocean Gallery includes the 306,000-gallon Living Shipwreck as well as the Sportfishing Gallery and the Changing Exhibits Gallery. Recommended for parties of 175 or fewer, this option includes use of the catering kitchen and assistance from the Special Events Coordinator, Housekeeping and Aquarium Security. • Minimum five-hour rental, 5:30 p.m. to 10:30 p.m.
• Note that total time rented includes set-up, event and clean-up. Additional Hours: $425 per hour charge over standard five-hour time frame. Entire Aquarium rental consists of all public spaces in the Aquarium, including five galleries of exhibits totaling over 30,000 square feet, the Big Rock Theater (as needed), Soundside Hall (as needed), the Salt Marsh Boardwalk and other public spaces. Recommended for parties of 125 or more, this option includes use of the catering kitchen and assistance from the Special Events Coordinator, Housekeeping and Aquarium Security.